A judge in Gwinnett County, Georgia has been suspended for comparing those taking down Confederate monuments to the terrorist group Islamic State. There has been a nationwide push across the US to remove Confederate symbols from public squares. 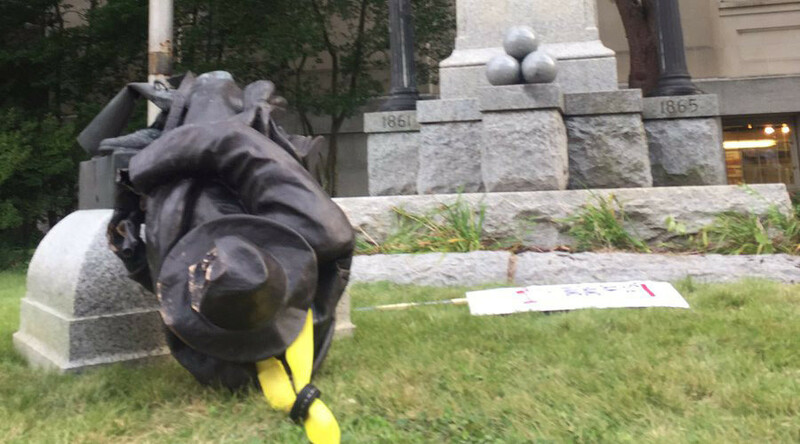 “The nut cases tearing down monuments are equivalent to ISIS destroying history,” Judge Jim Hinkle wrote on Facebook Tuesday, the same day protesters in Durham, North Carolina toppled a statue honoring Confederate soldiers. On Saturday, Hinkle had written that protesters in Charlottesville, Virginia were “snowflakes” with “no concept of history,” as they came to counter a rally of white nationalists who gathered to oppose the planned relocation of a statue to Confederate General Robert E. Lee. That post was written approximately an hour before a car crashed into a group of counter-protesters in Charlottesville, killing a woman and injuring 19 other people. Police have charged the driver, who reportedly took part in the white nationalist rally, with second-degree murder. “I have suspended Judge Hinkle effective immediately while I consider the appropriate final action,” Gwinnett County Chief Magistrate Judge Kristina Hammer Blum told The Atlanta Journal-Constitution (AJC) Tuesday. Hinkle told the AJC he didn’t “see anything controversial” about the posts. “But you know, with the way things are going in the world today, I guess everything’s controversial,” he told the outlet. Authorities in many US states have called for removing Confederate statues, seen by many as symbols of support for slavery and racism. “Some people cling to the belief that the Civil War was fought over states’ rights. But history is not on their side. We cannot continue to glorify a war against the United States of America fought in the defense of slavery. These monuments should come down,” North Carolina Governor Roy Cooper, a Democrat, wrote Tuesday. During the night between Tuesday and Wednesday, authorities in Baltimore, tore down and hauled away four Confederate monuments, hours after the city’s council voted for the move. The mayor said she wanted to avoid violence. Crews removed statues of Confederate Generals Robert E. Lee and Thomas J. “Stonewall” Jackson, who led Southern forces against the Union army during the 1861-65 American Civil War. This week, protesters in many cities across the US marched to monuments of Confederate leaders and soldiers demanding that they be torn down. On Monday, authorities in Gainesville, Florida ordered the removal of a Confederate statue commemorating men who died fighting for the South. 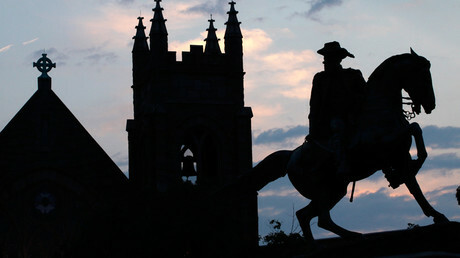 The mayor of Lexington, Kentucky followed suit, saying that statues of Confederate generals Breckinridge and Hunt Morgan will be taken down from the city’s historic courthouse precinct. Birmingham, Alabama Mayor William Bell has announced that he has ordered the 52-foot Confederate Soldiers and Sailors monument in Linn Park to be covered with plastic and plywood. An Alabama law, passed in May, says the statue can not be removed, but it will now be covered up until the city can look at legal options to have it removed, according to WBRC. The president referred to the fact that both the first and the third presidents of the US had owned slaves.